I have my hallway sideboard done up with a touch of "Spookification". Just enough to be an itsy bit "weenish". I always have to apologize in advance for the photos because this is an inner hallway with no natural lighting. Sometimes I get ambitious and "clone" out the 80's monster doorbell, air vent, and the thermostat, but today what you see is what you get. I'm still totally in love with my Pier 1 chalkboard that's all curvy and scrolly. It's sitting in front of my large paned window that's been here for a couple of years. They make a good backdrop for any Holiday or Season. My sis made the Boo Banner for me a couple of years ago, and gives just the right "fright factor". I know you're scared, huh? 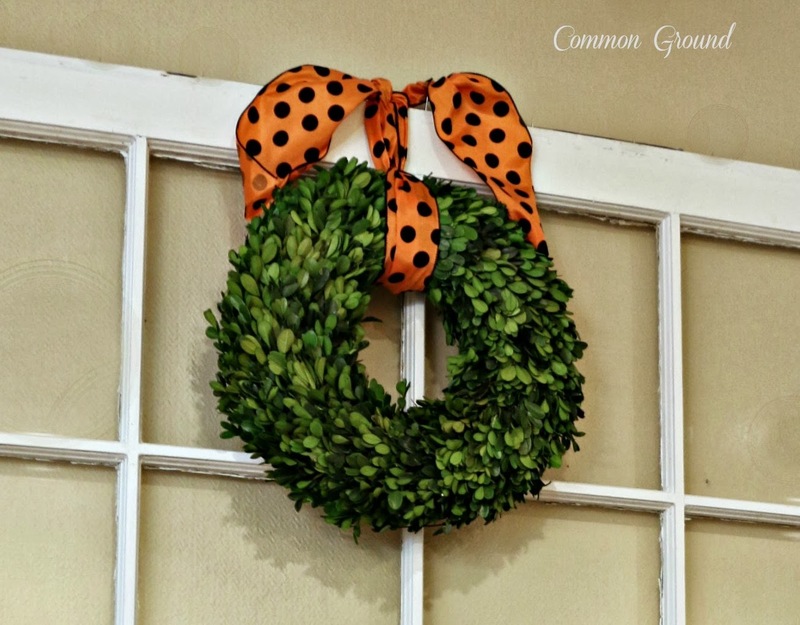 I finally found a preserved boxwood wreath this Spring. I had wanted one last Christmas, but I refused to pay the big bucks prices they were asking for them. If there were deals, they were always sold out super fast. So when I found one for a good price I was thrilled. I just added some fun polka dot satin wired ribbon, then I'll just change out the ribbon and use it through the first of the year. Since this is a sideboard and a sideboard is supposed to hold dishes, I always like to have some dishes and serving pieces sitting around appropriately. I'm using a little black wagon to hold the tureen, plates, silverware and napkins. And look who flew in...my baby snow owls and the owl collage I made earlier this Fall. Hoooooo doesn't just love a baby snow owl? Here are my creepy little friends from the old Bird Book. I always love having something fun here to look at. The turkeys are up next! I promise I didn't forget about the Give Away winner. and we'll get your piece created! off the rest of the month of October. 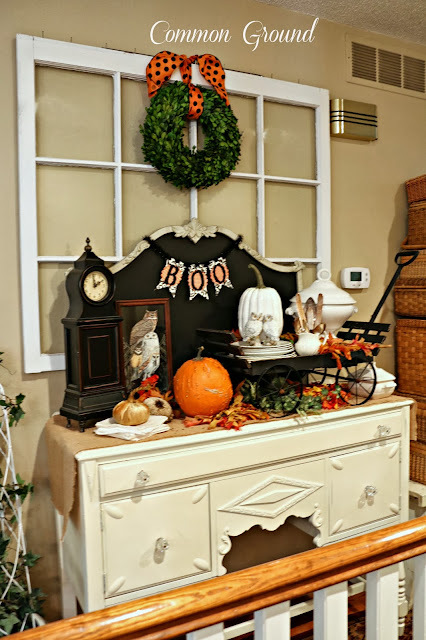 Gorgeous "Spooky" sideboard, dear friend!!! I love that you were able to find some large Sunflower heads!!! while the heads were still on the stems!!! Your "SNOW" owls are adorable!!! The chalkboard is awesome!!!!! I want the Snow Owls. Love it all, Debra! That little wagon is precious and I am loving that black clock. Great chalkboard, too. 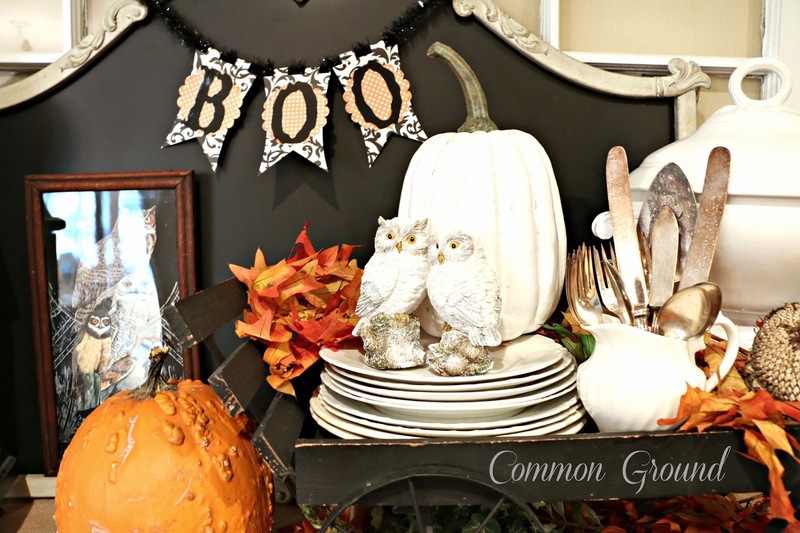 This is so pretty, Debra...love the fun chalkboard and all the owls especially! Beautiful! What a perfect Halloween vignette, Debra! I love love the little black wagon and chalkboard. I love me some owls and I really want a boxwood wreath as well. Still looking for a reasonably priced one. I love that your sister made the banner. How wonderful is your vignette. I appreciate that you found a good deal on your wreath and can use it for months just by changing ribbon. Your sideboard looks just beautiful. Love that chalkboard. Such pretty lines. You always make the most gorgeous vignettes. Great bit of spook vignette, Debra. Love the owls. looks great Debra!! I love the look of faded dried sunflowers. Need to find a few of those! So organic. I love this, Debra! Spooky, fun and not over the top. 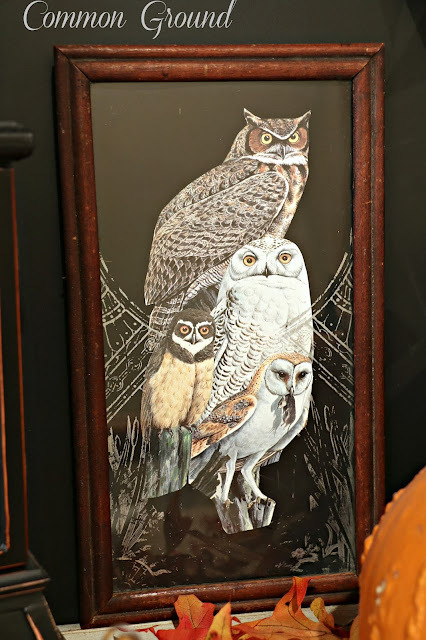 The owl print with the dead mouse is a little too realistic for me as we have spotted the real thing in my house, but it belongs in the vignette! LOVE the chalk board! 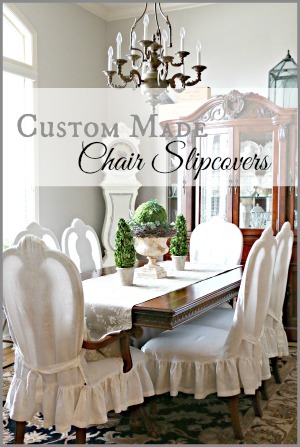 Love your sideboard display. It has just the right amount of spookiness! I just love this, Debra. 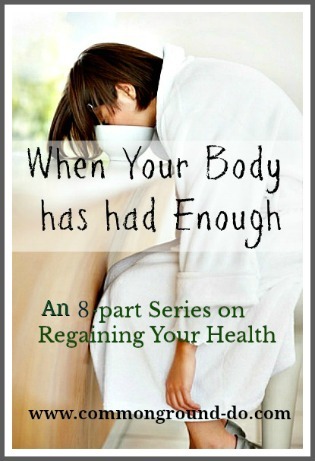 It is just enough! I don't like all the creepy stuff! This is so elegant, and each detail is perfect. Love that wreath, too, and the chalkboard! You have such a great eye! Longing to chat! I'll be in touch soon! Debra your sideboard looks SPOOKTACULAR!! Love the chalk board and those white owls are fantastic. It all looks like spooky fun. Hi Debra, I love the sideboard! It's so festive and the Pier 1 chalkboard is so cute. I need to pop over there and check out their holiday merchandise! Your little owls are darling:) and so is the wagon. 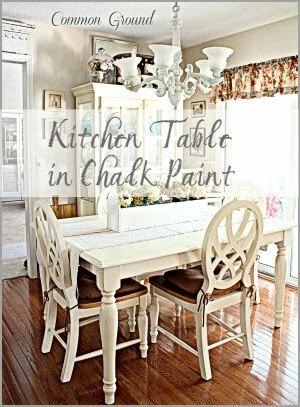 Love your sideboard and especially LOVE that chalkboard! Congrats to the lucky winner:) Have a blessed day dear friend! BIG HUGS! It all looks wonderful. I adore all the cute owls you have used. Love it, Debra - especially those owls! You inspired me to do a little vintage owl project that I'll be sharing soon! 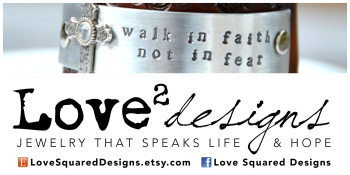 Also, just noticed the Walk in Love ad on your sidebar! Brooke & TJ are great friends of ours! I didn't know they were advertising on blogs - so I'm going there right now to check it out! What a perfectly spooky little side board! Love the wagon and clock especially! Your chalkboard is wonderful, Pier 1 you say, so cute!! Can't wait to see the turkeys! so cute Debra!!! Love your boxwood wreath, and I am with you- I love them, but every time I see one I just can't pull the trigger. Even when they are at "discount" stores, I always think- this is still outrageous!! Your sideboard vignettes are always sensational!! !...Congrats to the winner! I was here yesterday but I had to tell you again that I am so thankful that I read your note about png verses jpeg for the header. I was able to switch my header perfectly, thanks to you!! BTW - your new header is lovely - entertaining to see your changes. THX! I bet this gets pinned a few hundred times! So many wonderful elements here. Love that chalkboard too. And the dishes. Fun all over! Debra, you did it again!! 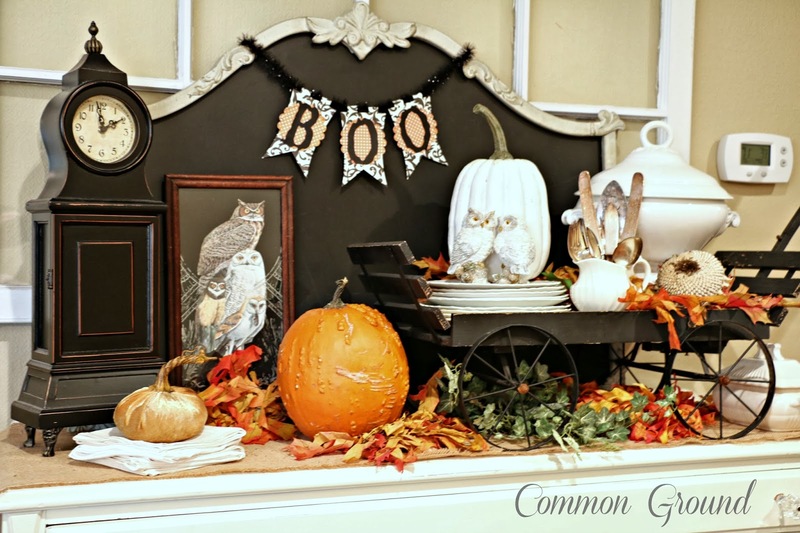 Your spooky sideboard is a perfect fun Halloween vignette! 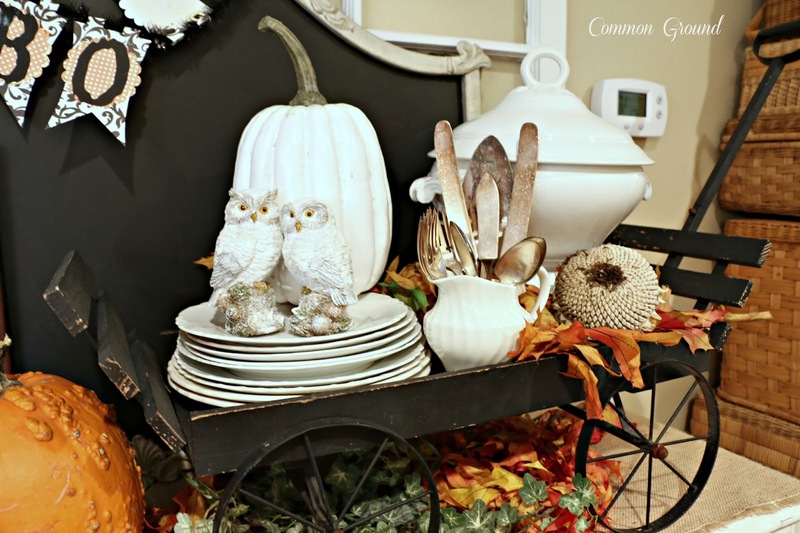 I love your snowy owls and chalkboard, and little black wagon add lots of whimsy to the look! Congrats to the winner, lucky girl! Happy Wednesday! Looks spookingly awesome Debra! :) Thanx for sharing at my place. there is so much to love here, debra. the owls are sweet and i LOVE your chalkboard esp. :) have a great night! 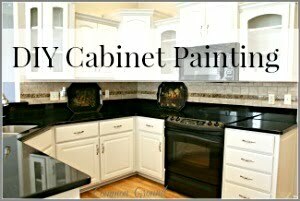 I love your sideboard! Spooktacular! Terrific sideboard! 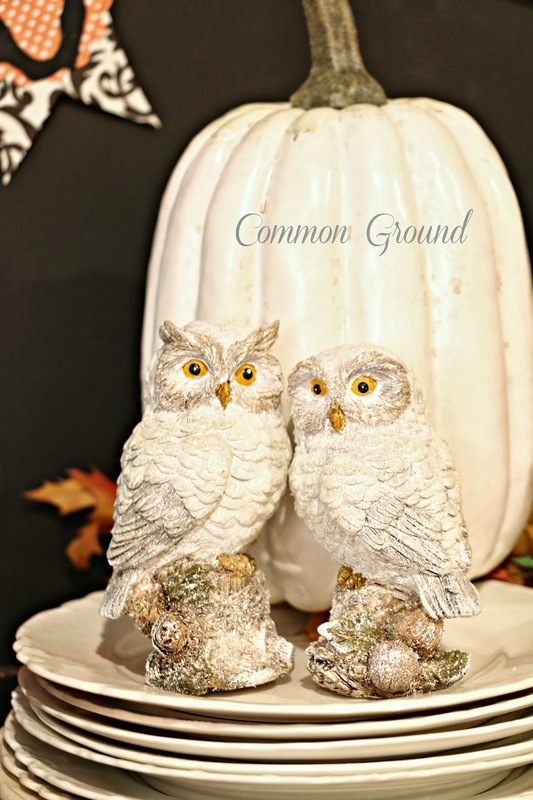 The snow owls are lovely and add the perfect touch to your wonderful décor! I love all your wonderful spooky items! Just perfect for Halloween . Oh...this display turned out so nice! I at first thought the chalkboard was the backboard to the buffet and then I realized it was the Pier 1 chalkboard. It looks fantastic in this spot. You know I never saw it in person. We were suppose to have at our store but I never found it. I never saw it again and it disappeared on the website. Sometimes we get a very small quantity of something in to see how it sells and if it sells fast...they order more. I'm wondering if these will show up again at some point? But even at that...it should have shown up by now. I think you were lucky to get it. It's all so beautiful! LOVE the banner that was gifted to you! 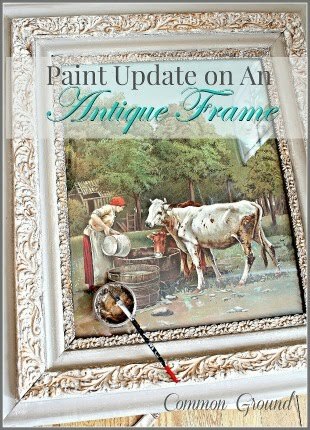 Your vintage ironstone adds just the right touch too! Precious is the word to describe this vignette. Your little black wagon caught my eye with the pretty china and darling owls. I love your black clock for it fits perfectly with your design. The chalkboard from Pier 1 is lovely with all the curves. 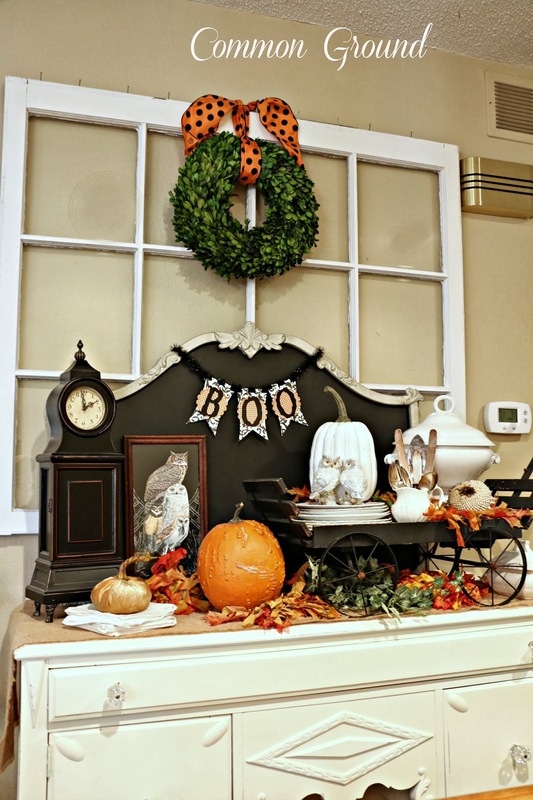 I posted an owl themed tablescape a couple of weeks ago and really enjoyed seeing your owls. Have a fun fall week! Great Spookification! It looks scary good.....and I love that chalkboard. 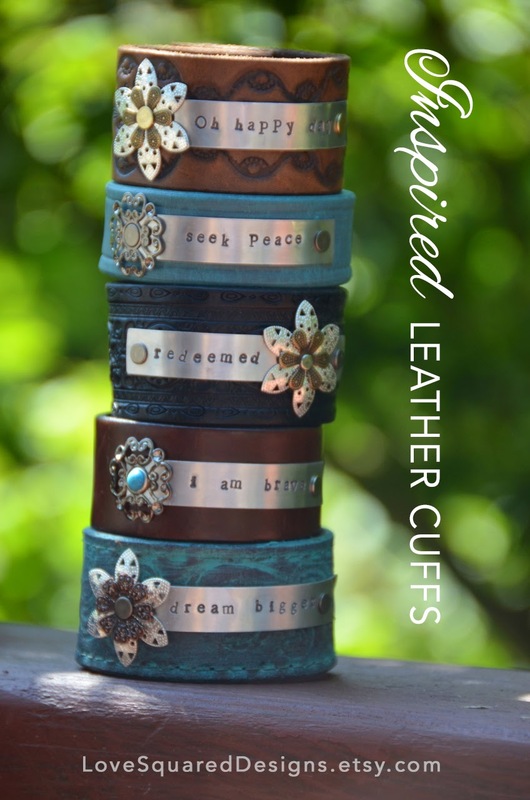 Gorgeous touches! Love the chalkboard headboard! 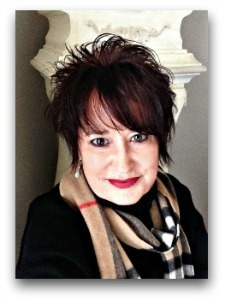 Wonderfully elegant and spooky at the same time, Debra! I would be so tickled to walk in a home and see this entry way. Such cute styling! You have a gift for that! I love the owls. Great look! 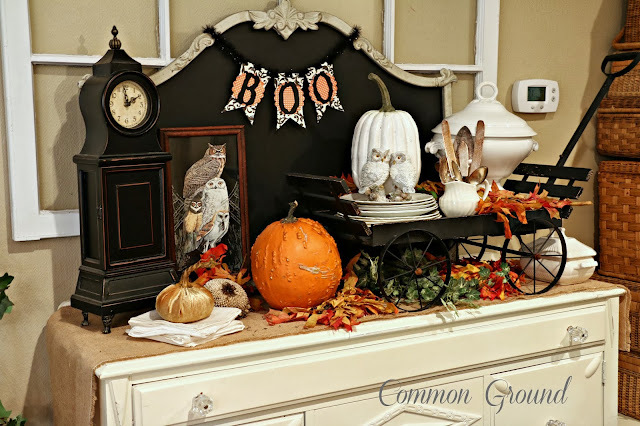 Debra, Just wanted you to know I will be featuring your wonderful Spooky Sideboard this week at Simple & Sweet Fridays. By the way, Happy Halloween!! 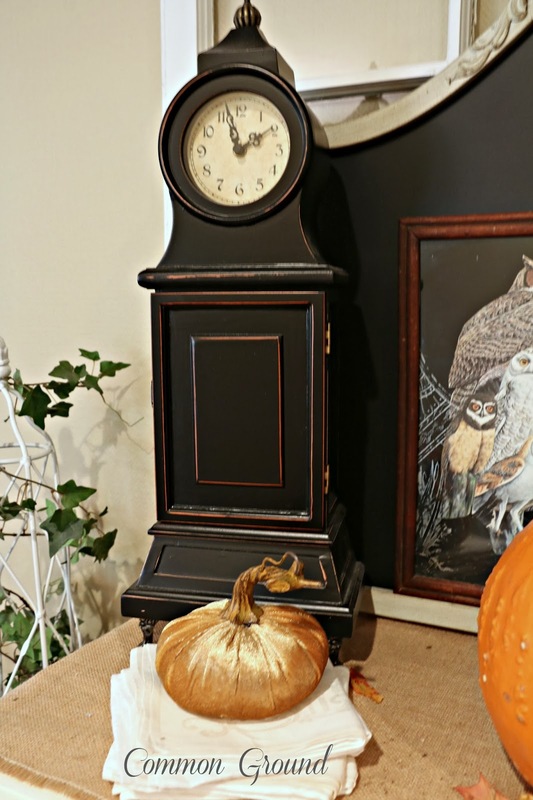 Your sideboard looks so spook-alicious Debra. 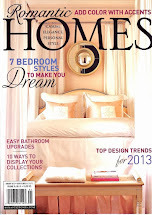 I always enjoy your seasonal vignettes and look forward to the next exciting change. 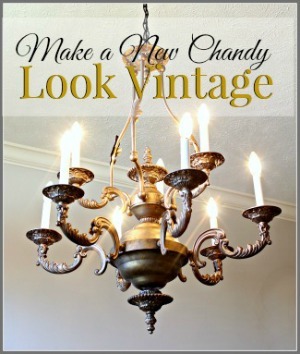 I featured this on Mod Mix Monday at Mod Vintage Life!